New York's leading 2YO Sales Sire with juveniles selling for $350,000, $150,000, $120,000, etc. A grade one performer at two, and a grade one winner at three and four, Alpha captured five stakes events, four graded, including the Travers Stakes (G1) and Woodward Stakes (G1). By A.P. Indy’s Champion son, Bernardini, Alpha is out of a stakes winning Nijinsky II mare, and his second dam, a two-year-old graded stakes winner, is out of Champion and Broodmare of the Year, Kamar. Alpha’s broodmare sire, Nijinsky II, is a close relative to Storm Bird, and this is a strain that has done very well under Bernardini. 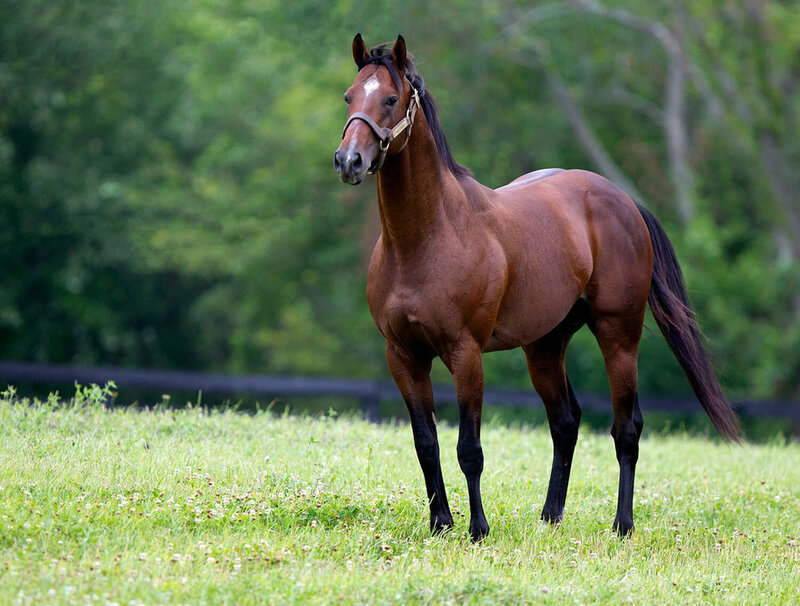 Storm Bird himself is broodmare sire of Bernardini’s multiple grade one winner Stay Thirsty, and Bernardini has three stakes winners, including graded winners Lewis Bay and Theyskens’ Theory, out mares by Summer Squall, a Storm Bird half-brother to Bernardini’s sire, A.P. Indy. Bernardini and sons have also done very well with mares descending from Storm Bird son, Storm Cat, with graded winner Buffum out of Storm Cat mare; three stakes winners, including graded scorer Sassicaia out of mares by Forestry (sire of Discreet Cat, also broodmare sire of a Bernardini stakes winner, and of Shackleford); grade two winner Spellbound out of a mare by Tale of the Cat (sire of Lion Heart); grade two winner Lovely Bernadette out of a mare by Bernstein; graded winner Edison out of a mare by Exploit; two stakes winners out of mares by Giant’s Causeway (a brother to Freud, and sire of First Samurai); as well as a stakes winner out of a mare by Harlan’s Holiday (sire of Into Mischief). Other sources of Storm Cat include Forest Wildcat, Hennessy (and his sons, Johannesburg and Henny Hughes), Stormy Atlantic and Stormin Fever (who both give a well-placed double of Seattle Slew), Tabasco Cat, Sir Cat and Bluegrass Cat (giving a well-placed inbreeding to A.P. Indy). Storm Bird is a son of Northern Dancer and Bernardini has also excelled with the Deputy Minister branch of that line, getting grade one winners To Honor and Serve and Angela Renee out of a mare by Deputy Minister himself; graded stakes winner Penwith out of a mare by Touch Gold (also broodmare sire of a stakes winner by a son of Bernardini); and stakes winner Exclusive Diva out of a mare by Dehere (sire of Graeme Hall, the broodmare sire of Bernardini stakes winner Seymourdini). This also suggests trying mares by Silver Deputy (sire of Posse), Awesome Again (sire of Ghostzapper), Salt Lake, French Deputy and Forest Camp. A.P. Indy line stallions have done well with mares descending from Northern Dancer through Sadler’s Wells, and this includes a Bernardini stakes winner out of a mare by Galileo, and Bernardini grade one scorer, Rachel’s Valentina, out a mare by Medaglia d’Oro, a son of El Prado, himself broodmare sire of Bernardini graded stakes winner Carrumba. El Prado can also be brought in through Kitten’s Joy and Artie Schiller. A.P. Indy has also enjoyed success with Sadler’s Wells through Horse Chestnut. Bernardini has three stakes winners, one grade one, out of Danehill line mares, and the A.P. 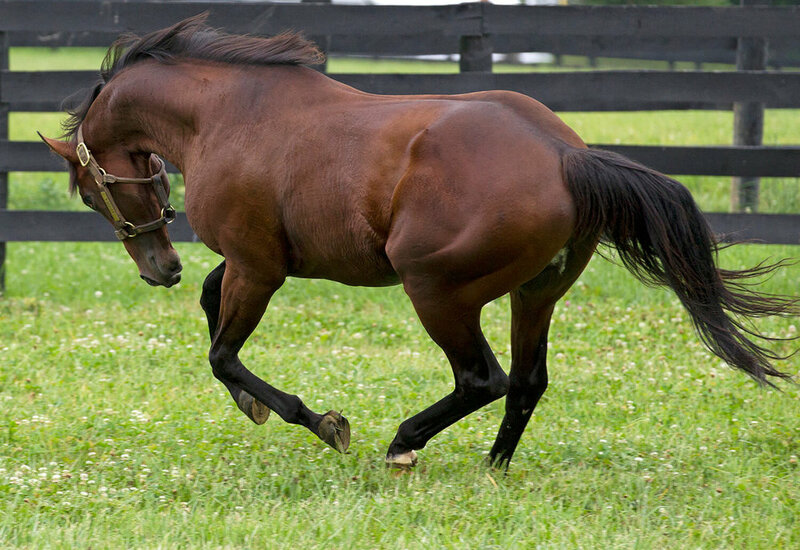 Indy line has enjoyed significant success with mares from the line of Danehill’s sire, Danzig, including stakes winners out of mares by Belong to Me, Boundary, Chief’s Crown (sire of Concerto, grandsire of Bellamy Road), Honor Grades (giving inbreed to Weekend Surprise, which is already found in the three Bernardini graded stakes winners), Langfuhr, Lost Soldier, Pine Bluff and Polish Numbers. Other sources would include Dayjur, Exchange Rate, Hard Spun and War Chant and War Front. Icecapade is a three-quarters brother to Northern Dancer, and crossed over mares descending from Icecapade, Bernardini is sire of graded stakes winner Imperative out of a mare by Caller I.D. (by Phone Trick) and graded stakes winner Le Bernardin, out of a mare by Wild Again (sire of Offlee Wild, Milwaukee Brew, Vicar and Wild Rush). Considering mares from the Mr. Prospector line, Bernardini has been exceptional with daughters of Carson City, getting five stakes winners, including the grade one winners Cavorting and A.Z. Warrior, and this is a strain that can be introduced through Good and Tough, City Zip, Flying Chevron, Lord Carson, Five Star Day, Cuvee and Pollard's Vision. Bernardini also has grade one winner Dame Dorothy out of a mare by Woodman (sire of Hansel); grade one winner Takaful out of a mare by Distorted Humor, and a graded winner out of a mare by Ecton Park (both by Forty Niner, also sire of Coronado’s Quest, Gold Fever, Roar, Gold Case, End Sweep, Trippi, Precise End, Twining and Luhuk); graded stakes winner Gamilati out of a mare by Kingmambo (whose son, Lemon Drop Kid, is out of a three-quarters sister to A.P. Indy); graded stakes winner Innovative Idea out of a mare by Seeking the Gold (sire of Petionville, and of Mutakddim and Cape Town, who both give well-placed inbreeding to Seattle Slew, with Cape Town also giving inbreeding to the family of Alpha); and a stakes winner out of a mare by Smart Strike (suggesting daughters of Curlin and Lookin At Lucky). It could also be interesting to bring in Mr. Prospector through Northern Afleet (sire of Afleet Alex), who is from the same sire line and family as Alpha’s graded stakes winning second dam, and is broodmare sire of a stakes winner by a son of Bernardini. Bernardini also has multiple graded stakes winner Romansh out of a mare by Go For Gin (by Cormorant), and two graded stakes winners out of Blushing Groom line mares, including one out of a mare by Cherokee Run (sire of Kafwain and Yonaguska). A son of Bernardini has graded stakes winner Rich Mommy out a mare by Honour and Glory (by Relaunch). There are also two stakes winners by sons of Bernardini out of mares by Yes It’s True. 7f, D, defeating Invocation, Africanist, Go West, Hierro, Timely Tally, Julius Caesar, Little Wyatt, A Cat That Flies, Nandino. 8f, D, to Union Rags, defeating Right to Vote, Takes the Gold, Invocation, No Spin, Power World, Laurie's Rocket. 10f, D, defeating Fast Falcon, Atigun, Nonios, Neck 'n Neck, Stealcase, Speightscity, Liaison, Five Sixteen, Street Life. 9f, D, defeating Neck 'n Neck, Liaison, Teeth of the Dog, My Adonis, Atigun, Fast Falcon, Prospective. 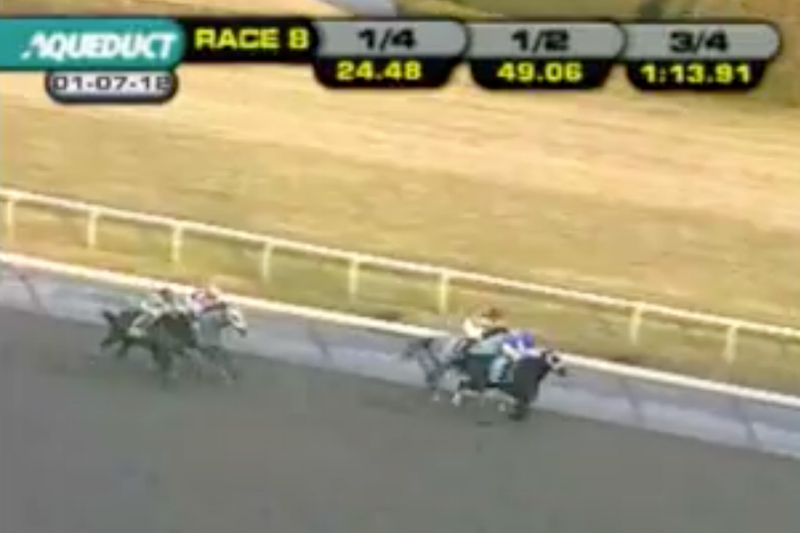 8.5f, D, defeating Speightscity, Tiger Walk, How Do I Win, King Kid, Hakama. 8.32f, D, defeating Stephanoatsee, Il Villano, How Do I Win, Speightscity, Whistleblower, Shkspeare Shaliyah. 9f, D, to Gemologist, defeating Teeth of the Dog, Tiger Walk, The Lumber Guy, Street Life, My Adonis, Casual Trick. 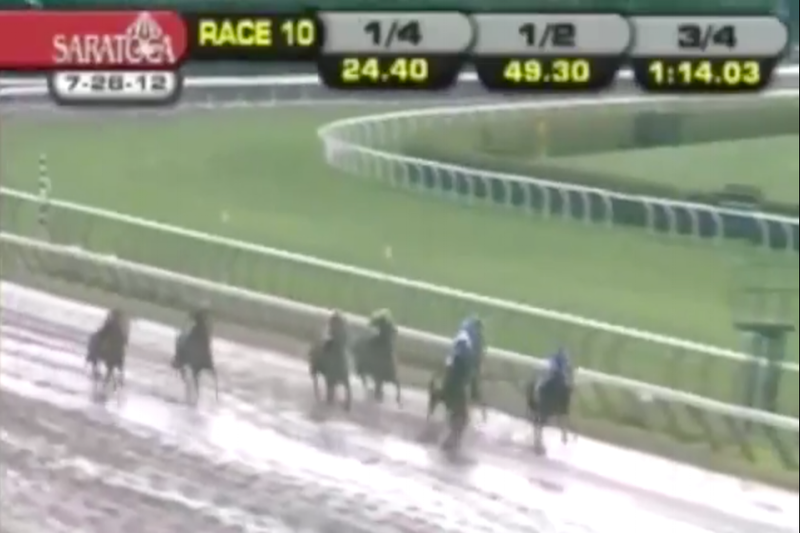 9f, D, defeating Flat Out, Successful Dan, Ron the Greek, Paynter. 9f, D, to Farhaan, Stormin Monarcho, defeating Dawly, Csaba, Easter Gift.